Last Minute Ryan took a special moment during today's North Seattle 250cc Street Shred to get the rear spinning on the super fun Cleveland CycleWerks Tha Misfit motorcycle. We had blast on the ride. Yesterday I had myself a micro local adventure. First, I rode the Seattle Metro #358 Express bus. Then, I took the ferry to Bremerton. When my Move To Bremerton was done, I took a walk. It was a chilly winter day. I picked-up a fresh 2012 Yamaha WR250R dual-sport motorcycle. What a dream. The name of the machine is "Two-Fiddy." It was a wet, rainy December. We still took time to play in the mud at Tahuya. I had a bit of fun with the GoPros and captured a bit of it. 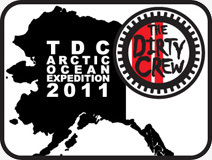 If I remember correctly, some of The Dirty Crew attended the EnduroCross event in Everett. Here is MisterBigWheel's account of that event. There has to be a twist. 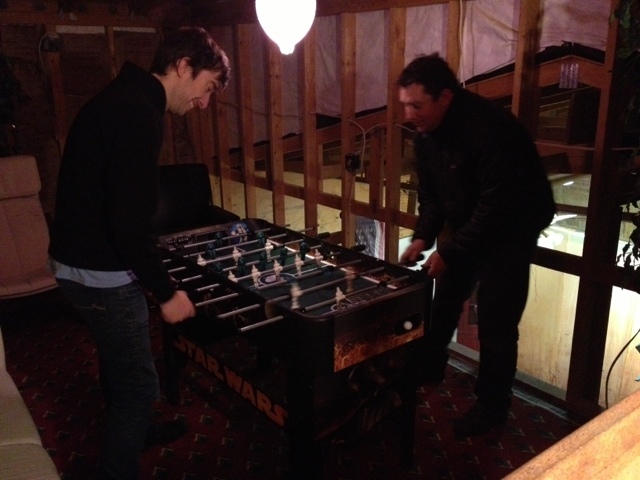 After the End Of Days party in Portland, select members of TDC relaxed with a few drinks and a little foosball. And yes, it was caught on video. Here is a panoramic shot of the new TDC Clubhouse. Note this was Swamp Monster's first attempt at a panoramic Photosynth shot, so it's a little rough. He's better now. Last Minute Ryan and Swamp Monster enjoy a quick game of Star Wars foosball in The Dirty Crew's clubhouse between motorcycle maintenance tasks.